Can You See I’m Grateful? The single American holiday dedicated solely to being thankful is over. For most of us, nothing is left but the turkey no one wanted and maybe a stained tablecloth. The Oxford American Dictionary defines “grateful” as “feeling or showing that one values a kindness or benefit received.” The first question is, what kindnesses or benefits have you or I received this year for which we’re honestly grateful—meaning we didn’t take them for granted–we noticed? Maybe noticing the kindnesses and benefits around us is the most difficult part. We’re tuned in to the negative—what’s wrong? Who did it or didn’t do it? Why isn’t (fill in the blank) better? Problems need fixing, so we focus on them. We’re measured with tests and evaluations and ratings. We look for what’s wrong with our jobs, our families, our towns, and our government. We feel smarter when we’re criticizing. But spending so much time and energy criticizing distracts us from what’s kind or beneficial. Start small. In this past week, what kindnesses or benefits have you experienced? Who smiled when it wasn’t required? Who offered something—anything—that he or she didn’t have to offer? A ride? A place in line? A bit of advice? A moment of caring? Feeling gratitude is only the first part. The second part is showing that you value what was given. 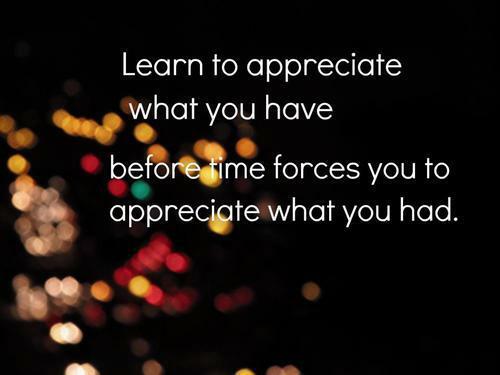 How many times do we appreciate something or someone without showing we do? What did you do with the pictures of turkeys the children drew for you? How did you thank weird Aunt Harriet for the casserole she worked so hard to provide (even if it did have way too much salt)? How will you repay the neighbor who watched your dog for you? Perhaps the link between Thanksgiving and Christmas is our movement from feeling gratitude to showing gratitude. Gifts we buy are the cheapest way to show how we feel. A couple clicks and the Internet delivers your greetings or packages. Giving something truly precious such as time—answering that sorrowful email from your old friend—going so far as to actually call on the phone, visiting your ailing relative or neighbor, sitting down to play with the children who may or may not belong in your life. Instead of merely donating the items you don’t want, try donating items you do want—such as your time and energy. The donation doesn’t have to be big. Our resources are limited. Our love isn’t. How can we stretch one using the other? My physical gifts this year will be small, inexpensive tokens—something to unwrap and hold as proof someone cares. I won’t have time to reach out to everyone who has made my life more beautiful or, at least, wiser. But I’m going to try. This entry was posted on December 5, 2014 by Personal Journeys with Gramma in Musings and tagged Appreciation, Attention, Beneficial, Benefits, Christmas, Donation, Energy, featured, Feeling Grateful, Feeling Gratitude, Gratitude, Holidays, Kind, Kindness, Love, Musings, Offerings, Resources, Showing Gratitude, Thanksgiving, Time, Want vs. Necessity.